Tennis meets RPG in Clap Hanz' latest triumph. We know that Clap Hanz can make a good golf game, after seeing numerous Hot Shots Golf titles on the Sony PSP and the PlayStation 3. However, it needed to spruce up its time on the tennis court, as Hot Shots Tennis on the PS2 left a lot to be desired. We're happy to say that, after three years, it's finally got its racket together with the PSP release, Hot Shots Tennis: Get a Grip. Like Mario Golf: Toadstool Tour on the Game Boy Advance, Hot Shots Tennis: Get a Grip has cool role-playing features. You're either a male or female member of the Love Tennis Club, where people, um, love tennis. Your job is to find and recruit some of the best tennis players to join your team and win championships for your club. It's not just a matter of tracking down folks and beating them, however. There are several tasks that can help your character evolve, via a heart system that fans of the Hot Shots games will instantly recognize. There are a couple of things you'll need to accept. First, not every task involves tennis. Some of them are a little odd, like having to find a dog or breaking vases to snag items. You'll also have to occasionally backtrack to a previous match to properly upgrade a character. Also, the gameplay, while functional, never changes. Even if you power up your character to another level, you're still swinging a racket at a ball. That said, there's still lots of fun to be had. Hot Shots Tennis' controls were well done, as you can deliver backhands, lobs and aces like a pro, no matter what your skill level. The pure addiction of tennis is very much at play, especially during the "boss battles", when you go head-to-head against an opponent. There's also some neat swing indicators that let you know if you've gone too slow (with the image of a turtle) or if you're too quick (an image of a rabbit). It's simple to learn, and if you run into trouble mastering it, you can always bump down the difficulty until you get it right. Like any good tennis game, Hot Shots Tennis offers multiplayer. Although there are no Infrastructure options (that we could find), the AdHoc features are excellent, as you can easily hook up with a friend in a single or doubles match. There's also a Game Sharing option, so you can share the joy of tennis with others. A word of warning: Hot Shots Tennis is a little too cute for its own good. Even the Helghast character, taken from the Killzone series, has been transformed into someone who's huggable (although he's great to play with). 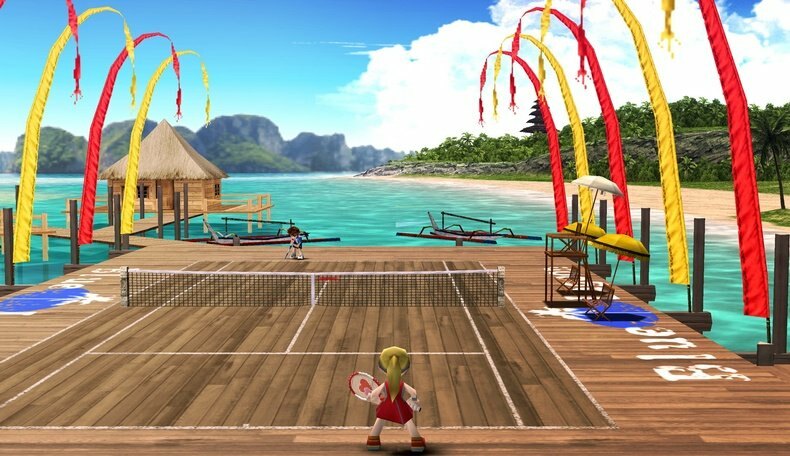 Still, the developer went all out creating a great world around the Love Tennis club, with a variety of gorgeous tennis courts (we like the beachside one, personally) and memorable characters (again, gotta dig the Helghast). Finally, the sound isn't bad, with some humorous voicework and soothing background music that lets you slip into this virtual world with very few problems. 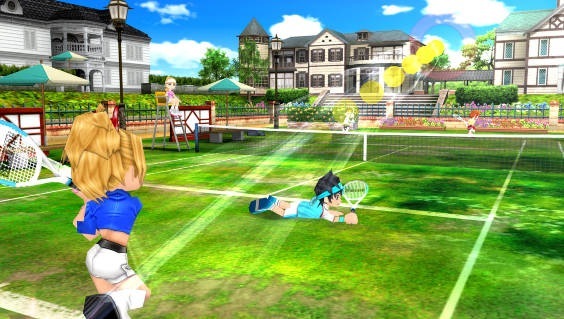 Even though Hot Shots Tennis: Get a Grip won't topple Virtua Tennis from its throne, it's a huge step forward from the PS2 disappointment we trudged through years ago. Clap Hanz learned from its mistakes and made a tennis game worth checking out, with approachable gameplay, excellent role-playing elements and a slick presentation. What's Hot: Terrific controls make the game fun for all ages, RPG-style level-up system, AdHoc multiplayer and Game Sharing lets others get in on the fun, bright and colorful graphics, you can unlock a Helghast. What's Not: Gameplay doesn't evolve much, cute overload.